June 2017 - A distributor has recently informed customers that the Little Step-U (Parallax #27938) had been made obsolete. While it appears that they will no longer be selling it, we have a number of OEM customers using it and it will continue to be available directly from TLA Microsystems. There is no intention or expectation of discontinuing manufacture of the Little Step-U. We apologise for any inconvenience. 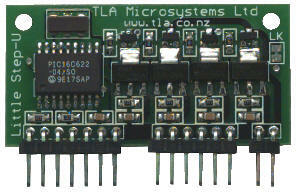 The Little Step-U is a complete stepper motor control solution in the form of a 1" x 2" PCB. A single TTL serial connection is sufficient to control a 30V/3A unipolar motor up 5000 steps/second in a set and forget fashion. Commands instruct the motor to move to an absolute position, a relative position, until an input is activated or return to one of two previously marked positions. 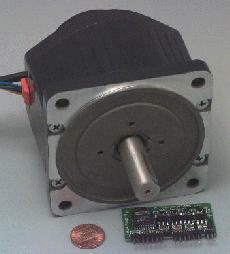 An inbuilt linear ramp function allows the motor to be accelerated and decelerated over a defined period. Other options are to drive the motor in full, half and wave drive modes, stop with windings on or off or to act as a simple translator/drive with step and direction inputs.